HOUSTON, March 19, 2019 (GLOBE NEWSWIRE) -- HP Reinvent: World Partner Forum -- Today at HP Reinvent, the company's largest global partner event, HP Inc. unveiled its next wave of office printing innovations empowering partners with seamless integration into the modern workplace. 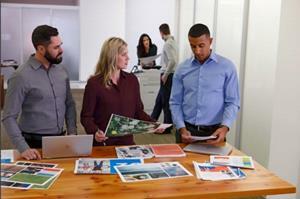 "We continue to lead and innovate around products and solutions for our partners – no matter where they are in their journey with HP," said Tuan Tran, General Manager and Global Head of Office Printing Solutions for HP. "Our robust portfolio – with smarter solutions and services, security, and the strongest printer and MFP lineup in the industry – is tearing down barriers between paper and digital, delivering on what businesses need today and in the future." At the heart of HP's innovation announcement is a suite of enhanced solutions and services that dramatically improves productivity for our customers. Smart Device Services (SDS): Dramatically helps reduce service costs, maximizes device uptime and delivers an exceptional service to millions of devices around the world. Partners who have adopted the SDS solution are reporting average service cost reductions of 17 percent2 or more. SDS can remotely resolve problems and arms service techs with the information to achieve higher first visit fix rates. SDS can now predict failures of key components just before they happen, enabling a fix before the device fails, giving users a no-downtime experience. | Watch how SDS is helping TT Tecnosistemi, who saved 23 percent on service costs in 2018. According to a recent survey, 83 percent of respondents had secured their PCs, and 55 percent their mobile devices, but only 41 percent had secured their printers 3. As a result, more and more businesses are increasing their requirements for print security, an area where HP's leadership in security solutions and standalone services give partners a winning edge. HP is the only print company that meets NIST requirements for cyber resiliency, has a Bug Bounty program and offers devices with embedded HP Sure Start BIOS protection and an inbound and outbound malware monitoring system all with self-healing capabilities. HP is the only print vendor with SD-PAC Certified firmware and software with robust secure software development lifecycle best practices incorporated into a solutions' design, development and testing. Certification includes HP FutureSmart firmware, HP JetAdvantage Security Manager, HP Access Control, HP JetAdvantage SecurePrint and HP JetAdvantage Insights. Extending HP's commitment to partner-focused security training, certification and sales tools, the company has introduced a partner security training and certification campaign with channel tools to easily assess print security gaps, develop proposals and offer revenue-generating security services. To date, more than 700 partners are participating. Fixed tray guides – help reduce a managed partner's highest call incident – paper jams. Predictive Sensors embedded within the device, combined with Cartridge Access Control, can save partners utilizing HP SDS, up to 17 percent2 in service costs. Expanded LaserJet 700 and 800 series with new entry-level models, featuring the industry's strongest print security to help protect customer's devices, data and documents. 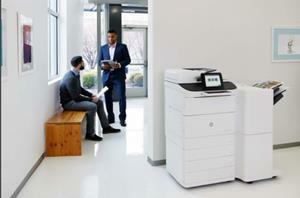 New energy efficient HP LaserJet A4 400/500 printers – with Original HP EcoSmart black toner – uses an average of 21 percent1 less energy than previous generations of HP printer systems. 1HP calculations based on Energy Star normalized TEC data comparing the HP LaserJet 300/400 series and 500 series monochrome printers introduced in spring 2019. HP 58/59/76/77A/X compared to HP 26A/X, and HP 89A/X/Y compared to HP 87A/X.